Depending upon the weather conditions, sap will start to flow immediately after tapping the tree. It drips from the spile into the bucket. 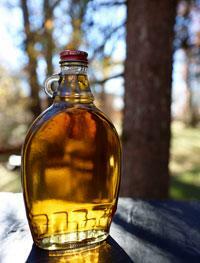 Maple sap is a clear fluid and resembles water. The collection amount may vary. Some days you will collect only a small amount and other days your buckets will overflow if not emptied. 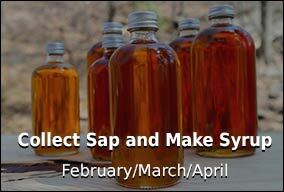 Use only food grade containers to store your collected sap. Clean plastic milk jugs or juice containers may be used. You can also use 5 gallon buckets (food grade quality). Your local deli or donut shop may provide these free of charge, as they often receive their ingredients in these containers. Be sure all containers are thoroughly cleaned using a mixture of one part unscented household bleach (such as Clorox® Regular-Bleach) to 20 parts clean water. Scrub the containers and triple rinse with hot water. When sap is flowing, collect the sap daily. Pour the sap from the bucket into a storage container, using cheesecloth to filter out any foreign material. If a portion of the sap is frozen, throw away the frozen sap. The sap should be stored at a temperature of 38 degrees F or colder, used within 7 days of collection and boiled prior to use to eliminate any possible bacteria growth. If there is still snow on the ground, you may keep the storage containers outside, located in the shade, and packed with snow. You can also store the sap in your refrigerator, or for longer term storage, in your freezer. Remember that sap is like milk, it will spoil quickly if not kept cold. A small pit is dug, using bricks to secure the walls of the pit. Metal bars are secured over the fire to support the pot. 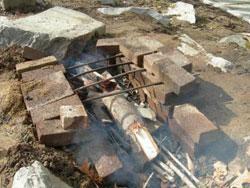 A fire is built in the pit with dried, split wood. 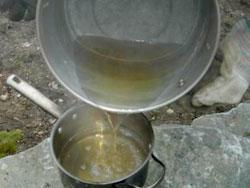 As it will take several hours to boil your sap into syrup, a sufficient wood supply is required. Fill a flat pan or large pot (a “lobster” pot is used in this example) ¾ full with sap. Place the pot onto the heat source. 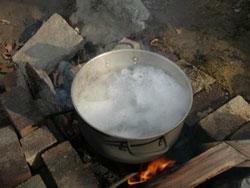 Once the sap starts to boil down to ¼ – ½ the depth of the pot, add more sap, but try to maintain the boil. If the sap is boiling over the edges of the pot, a drop of vegetable oil or butter wiped onto the edge of the pot will reduce this. The boiling sap will take on a golden color. Once the sap has “mostly” boiled down, but still has a very fluid texture, it is time to transfer the sap into a smaller pot. The outdoor heat source should be fully extinguished at this point. 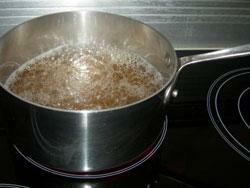 Once transferred to the smaller pot, the final boiling can be completed indoors. Continue to boil the sap until it takes on a consistency of syrup. One way to check for this is to dip a spoon into the sap / syrup – syrup will “stick” to the spoon as it runs off. It is important to watch the boiling sap very closely as it approaches syrup, since it is more likely to boil over at this point. If you have a candy thermometer, finish the boil when the temperature is 7 degrees F above the boiling point of water. Note that the boiling point of water differs based on your elevation. A small amount of sediment will be present in your syrup. This can be filtered out of your sap using a food grade filter. A coffee filter is suitable to filter a small amount of sap at a time. After letting the syrup cool, pour a small amount into a coffee filter, collect the top ends of the filter into a bunch, and press the syrup through the filter into a clean container (such as a measuring cup). Depending upon how much syrup is produced, this will need to be repeated several times (using a new filter each time). For larger batches, a wool or orlon filter can be used. You can also remove the sediment by allowing the syrup to stand overnight in the refrigerator, letting the sediment settle to the bottom. Sterilize a bottle and cap (or multiple bottles and caps depending upon how much syrup you have produced) in boiling water. Pour the sediment free syrup into the bottle, cap, and refrigerate.